She functions much like Conjurer Margoss, in that you fish up a currency which gives you reputation with her when you hand it in. Standing near her will give you the buff Something's Fishy, allowing you to fish up Fragmented Enchantment. Once in a while you may also fish up a Hatecoil Spearhead which will summon a Hatecoil Spirit. Kill the spirit and for a while your chance to catch Fragmented Enchantment will be greatly increased for all nearby players, so doing this with a group is beneficial. She is back 7.3, and has brought the other 5 fishermen for Fisherfriend of the Isles. Only one is up at a time. Each Fragmented Enchantment is currently worth 50 reputation. 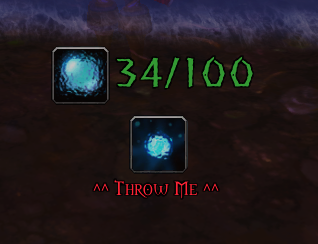 If you are farming this faction you can track how many Fragmented Enchantment you need to be "Best Friend" with the following macro this also takes 10% rep buff into account. With 6 Fishing Masters of the Broken Isles I expect them to sell all 18 rare baits for Bigger Fish to Fry, the open water baits maybe put into Impus' store (Broken Shore). You get the buff Something's Fishy at "her" pond, so maybe at the other fishers' locations too. Drag the macro icons to an action bar. The icons for the tool tips will be the default red question mark until you make your first catch. Then the icon will change to the inventory icon with the count. When you turn in Fragmented Enchantments or summon the Hatecoil Spirit using the Hatecoil Spearhead, the count will go to zero but the icon will remain. If you're solo fishing when Something's Fishy is up, it's really useful to know whether you've caught a Hatecoil Spearhead because you can only have one in your inventory at a time. As soon as you catch a Fragmented Enchantment, the icon (with count) will replace the default icon. If you turn in Fragmented Enchantments, the icon will remain and the count will go to zero. Keep Arcane Lure up to increase your chance of catching bait that attracts rare Azsuna fish. The ancient keeper of the Royal Pond in Azsuna.